LATEST FIGURES FROM the Department of Housing show a record number of people in Ireland were homeless in June, the end of Eoghan Murphy’s first full year in office. According to the Department, 9,872 people were in emergency accommodation during the week of 18-24 June, an increase of 26 people compared with the previous month. The figure includes 6,048 adults and 3,824 children, with a rise of 28 adults and two fewer children accessing emergency accommodation compared with May. It is the third consecutive month in which the figure has risen, following a decrease in March when the Department removed a number of people from its figures after it claimed to have “erroneously” overstated previous numbers. It also means that the total number has risen by 24% since June 2017, when Eoghan Murphy was named Housing Minister and 7,941 people were recorded as homeless. Since then, child homelessness has increased by 35% from 2,895, while the number of homeless adults has risen by 20% from 5,046. Homelessness increased in all but one of the nine regions measured by the Department over the same period. Dublin showed the biggest increase in homelessness over Murphy’s first year in office, with 1,266 more people in emergency accommodation than in June 2017. Only the North-West region, which recorded nine fewer homeless people, showed a decrease on the June 2017 figure. Speaking about the latest monthly figures, the Minister said any increase in the number of people in emergency accommodation was “unwelcome”, but said it was “good to see a decrease” in the number of homeless children. However, Sinn Féin housing spokesman Eoin Ó Broin hit out at the figure, saying Murphy has been “reluctant to take measures to keep people in their homes”. 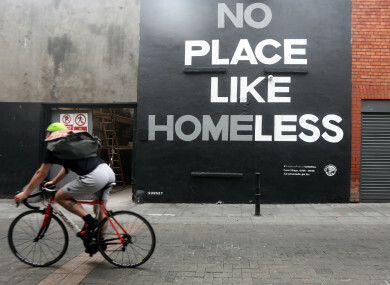 Homeless charities also criticised the announcement, with Focus Ireland saying the total should not be seen as “normal” or used to justify a ‘business as usual’ response. Inner City Helping Homeless CEO Anthony Flynn said homeless services were “in turmoil”, and hit out at Murphy for welcoming the month-on-month reduction of two children as “a victory”. He said: “The housing crisis is getting worse and has done so under Eoghan Murphy’s watch. His plan has failed, Government policy has failed. With additional reporting from Hayley Halpin. Email “Child homelessness rises 35% during Eoghan Murphy's first year in office”. Feedback on “Child homelessness rises 35% during Eoghan Murphy's first year in office”.